When wealth is lost, nothing is lost; / when health is lost, something is lost; / when character is lost, all I lost. A good character is the best tombstone. Those who loved you and were helped by you will remember you when flowers have withered. Carve your name on hearts, not on marble. How important is the heart! It is there that character is formed. It alone holds the secrets of true success. Its treasures are priceless – but they can be stolen. The within is ceaselessly becoming the without. From the state of a man’s heart doth proceed the conditions of his life; his thoughts blossom into deeds, and his deeds bear the fruitage of character and destiny. What most counts is not merely to live, but to live right. An important part of who you are is what you want to be. Character is revealed by how you act when you think no one is looking. Character is the sum and total of a person’s choices. 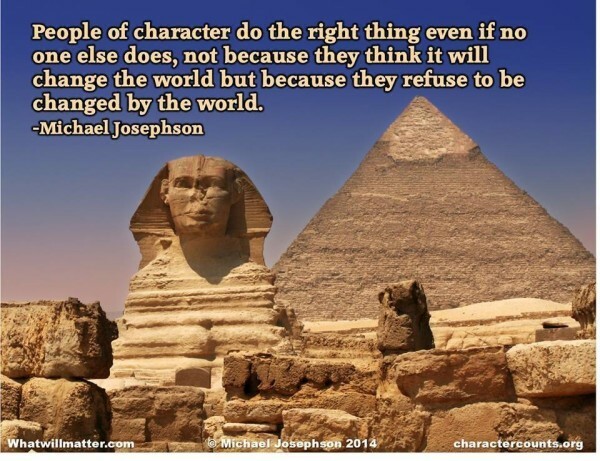 Character – The measure of a man’s real character is what he would do if he knew he would never be found out. Character is the sum of one’s good habits (virtues) and bad habits (vices). These habits mark us and affect the ways in which we respond to life’s events and challenges. 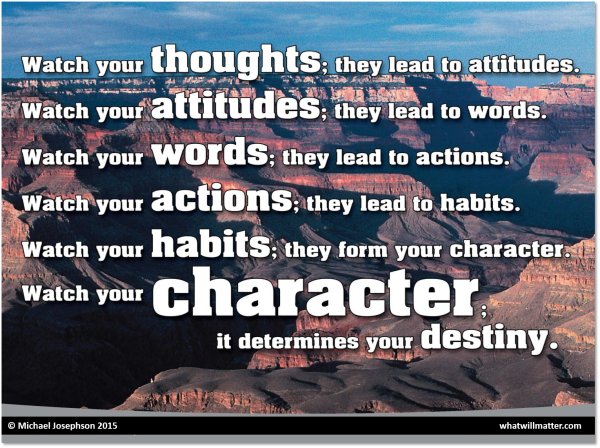 Our character is our profile of habits and dispositions to act in certain ways. Character is the foundation stone upon which one must build to win respect. Just as no worthy building can be erected on a weak foundation, so no lasting reputation worthy of respect can be built on a weak character. Without character, all effort to attain dignity is superficial, and results are sure to be disappointing. Character determines how we lead our lives, how we deal with life’s unearned fortunes and misfortunes and how we make choices that determine how those fortunes and misfortunes work to make us what we become. Character consists of the moral awareness and strength to know the good, love the good and do the good. Character is just another term for “good person.” A person of character lives a worthy life guided by moral principles. A person of character is a good parent, a good friend, a good employee and a good citizen. Character is the most effective means of persuasion. Character is not about how much we know how to do, but how we behave when we don’t know what to do. 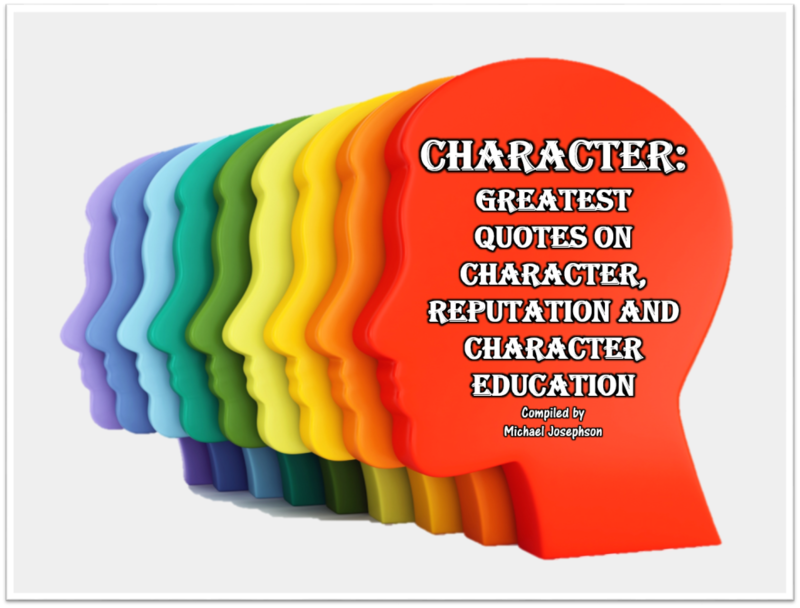 Character – We describe the character of a person in reference to moral judgments about the worthiness of a person. Thus, to have a strong, great or honorable character is to be a person of merit, worthy of admiration and honor. Character – Someday, you will be wrestling with the great temptation, or trembling under the great sorrow of your life. But the real struggle is here, now, in these quiet weeks. Now it is being decided whether, in the day of your supreme sorrow or temptation, you shall miserably fail or gloriously conquer. Character cannot be made except by a steady, long-continued process. Character is developed one positive action at a time. Therefore, nothing is actually trivial in our lives. To grow in character development, pay attention to seemingly trivial matters. Someone who grows from each minor life event will eventually reach high levels of character perfection. Good character is a universal concept composed of core ethical values that transcend cultural, religious and socioeconomic differences: trustworthiness, respect, responsibility, justice and fairness, caring, and civic virtue and citizenship. People of good character are not all going to come down on the same side of difficult political and social issues. Good people – people of character and moral literacy – can be conservative, and good people can be liberal. We must not permit our disputes over thorny political questions to obscure the obligation we have to offer instruction to all our young people in the area in which we have, as a society, reached a consensus: namely, on the importance of good character, and some of its pervasive particulars. What a person says and does in ordinary moments when no one is looking reveals more about true character than grand actions taken while in the spotlight. Our true character is revealed by normal, consistent, everyday attitudes and behavior, not by self-conscious words or deeds or rare acts of moral courage. Neither heredity nor environment determine character. But whether we give in to or overcome the negative messages we are exposed to as we wind our way through life is often determined by whether our parents, teachers, mentors and friends exposed us to good examples and morally inspiring ideas. The way we treat people we think can’t help or hurt us – like housekeepers, waiters, and secretaries -tells more about our character than how we treat people we think are important. How we behave when we think no one is looking or when we don’t think we will get caught more accurately portrays our character than what we say or do in service of our reputations. It is not the most distinguished achievements that men’s virtues or vices may be best discovered; but very often an action of small note. A casual remark or joke shall distinguish a person’s real character more than the greatest sieges, or the most important battles. One’s character is one’s habitual way of behaving. We all have patterns of behavior or habits, and often we are quite unaware of them. When Socrates urged us to Know thyself, he clearly was directing us to come to know our habitual ways of responding to the world around us. Tell the truth. Do your best no matter how trivial the task. Choose the difficult right over the easy wrong. Look out for the group before you look out for yourself. Don’t whine or make excuses. Judge others by their actions and not by their race or other characteristics. A man’s mind may be likened to a garden, which may be intelligently cultivated or allowed to run wild; but whether cultivated or neglected, it must, and will, bring forth… Just as a gardener cultivates his plot, keeping it free from weeds, and growing the flowers and fruits, which he requires, so may a man tend the garden of his mind, weeding out all the wrong, useless, and impure thoughts, and cultivating toward perfection the flowers and fruits of right, useful, and pure thoughts. By pursuing this process, a man sooner or later discovers that he is the master gardener of his soul, the director of his life. He also reveals, within himself, the laws of thought, and understands, with ever-increasing accuracy, how the thought-forces and mind-elements operate in shaping his character, circumstances, and destiny. The habits of feeling, action and judgment that comprise good character depend on personal self-discipline and powerful aspiration to become a good person, all of which must be drawn from within. Fortune does not change anyone; it only unmasks them. Whenever you are to do a thing, though it can never be known but to yourself, ask yourself how you would act if all the world were looking at you, and act accordingly. Ten Rules of Thomas Jefferson: Never put off till tomorrow what you can do today. / Never trouble another for what you can do yourself. / Never spend your money before you have it. / Never buy what you do not want because it is cheap; it will never be dear to you. / Pride costs us more than hunger, thirst, and cold. / Never repent of having eaten too little. / Nothing is troublesome that we do willingly. / Don’t let the evils which have never happened cost you pain. / Always take things by their smooth handle. / When angry, count to ten before you speak; if very angry, count to one hundred. Everyone knows that weeds eat out the life of the garden and of the productive fields. It’s like that in the building and developing of character. No one knows our own faults and tendencies better than we do ourselves, so that it is up to each one of us to keep the weeds out, and to keep all growth vigorous and fruitful. Knowledge will give you power, but character earns respect. Beware of people who constantly assert their integrity and honor. People of character don’t have to point it out. The heroic hours of life do not announce their presence by drum and trumpet, challenging us to be true to ourselves by appeals to the martial spirit that keeps the blood at heat. Some little, unassuming, unobtrusive choice presents itself before us slyly and craftily, glib and insinuating, in the modest garb of innocence… Then it is that you will be summoned to show the courage of adventurous youth. Fame is what you have taken, / Character’s what you give; / When to this truth you waken, / Then you begin to live. We do not need more intellectual power; we need more spiritual power. We do not need more knowledge; we need more character. How a people play the game shows something of their character; how they lose shows all of it. If someone lacks character, “Be yourself!” is the worst advice you can give. As you live your values, your sense of identity, integrity, control, and inner-directedness will infuse you with both exhilaration and peace. You will define yourself from within, rather than by people’s opinions or by comparisons to others. I have a dream…that one day my four little children, will one day live in a nation where they will not be judged by the color of their skins, but by the content of their character. One who faces and who fears the right things and from the right motive, in the right way and at the right time, possesses character worthy of our trust and admiration. There is the need for someone against which our characters can measure themselves. Without a ruler, you won’t make the crooked straight. You cannot hope to build a better world without improving the individuals. To that end, each of us must work for his own improvement and at the same time share a general responsibility for all humanity, our particular duty being to aid those to whom we think we can be most useful. The character ethic, which I believe to be the foundation of success, teaches that there are basic principles of effective living, and that people can only experience true success and enduring happiness as they learn and integrate these principles into their basic character. According as a man acts and walks in the path of life, so he becomes. He that does good becomes good; he that does evil becomes evil. By pure actions he becomes pure; by evil actions he becomes evil. Brihadaranyaka Upanishad (c 600-300 BC) sacred philosophical Hindu literature. Into the hands of every individual is given a marvelous power for good or evil — the silent, unconscious, unseen influence of his life. This is simply the constant radiation of what man really is, not what he pretends to be. If you will think about what you ought to do for other people, your character will take care of itself. 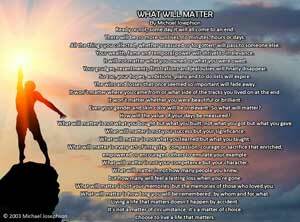 In great matters men show themselves as they wish to be seen; in small matters as they are. People that seem so glorious are all show. Underneath they’re like anybody else. Essential characteristics of a gentleman: The will to put himself in the place of others; the horror of forcing others into positions from which he would himself recoil; and the power to do what seems to him to be right without considering what others may say or think. Isn’t it possible that self-esteem isn’t causal at all, but simply the happy side effect of a sturdy character, itself the product of unambiguous moral education? During my eighty-seven years, I have witnessed a whole succession of technological revolutions. But none of them has done away with the need for character in the individual. Get to know two things about a man – how he earns his money and how he spends it – and you have the clue to his character, for you have a searchlight that shows up the inmost recesses of his soul. You know all you need to know about his standards, his motives, his driving desires, his real religion. Human character evermore publishes itself. The most fugitive deed and word, the intimated purpose, express character. Sincerity is impossible unless it pervades the whole being, and the pretense of it saps the very foundation of character. It’s easy to be independent when you’ve got money. But to be independent when you haven’t got a thing – that’s the Lord’s test. If you want to know what a person’s character, take notice of how he acts when he loses money. I’ve never met a healthy person who worried much about his health, or a good person who worried much about his soul. Men may be divided almost any way we please, but I have found the most useful to be made between those who devote their lives to conjugating the verb to be and those who spend their lives conjugating the verb to have. Our enemies’ opinion of us comes closer to the truth than our own. Reputation is character minus what you’ve been caught doing. Somehow it must be made plain that the lawyer’s moral judgment is not for hire, that there are occasions when the lawyer . . . is under a duty to act as a person of independent ethical concern with obligations not only to his client’s interests but also to fairness and justice in the management of affairs. Tell me thy company, and I’ll tell thee what thou art. The character and qualifications of the leader are reflected in the men he selects, develops and gathers around him. Show me the leader and I will know his men. Show me the men and I will know their leader. The lawyer’s conscience like his law is a learned thing, not intuitive, untutored, abstract; it is not everyman’s conscience. Applied to a specific case, the lawyer’s conscience is a reflection of an educated sense of justice under law and of a thorough awareness of a lawyer’s role in the system of continuing justice. There must be some point, at which the lawyer’s own personal and social morality will rebel against his traditional allegiance to his client. The real gentleman is one who is gentle in everything, at least in everything that depends on himself – in carriage, temper, constructions, aims, desires. He is mild, calm, quiet, even temperate not hasty in judgment, not exorbitant in ambition, not overbearing, not proud, not rapacious, not oppressive. Class has a sense of humor. It knows that a good laugh is the best lubricant for oiling the machinery of human relations. Class never makes excuses. It takes its lumps and learns from past mistakes. Class bespeaks an aristocracy unrelated to ancestors or money. Some extremely wealthy people have no class at all, while others who are struggling to make ends meet are loaded with it. Class is real. You can’t fake it. Class never tries to build itself up by tearing others down. Class is already up and need not attempt to look better by making others look worse. Everyone is comfortable with the person who has class because he is comfortable with himself. If you have class, you’ve got it made. If you don’t have class, no matter what else you have, it won’t make up for it. To brag little, to lose well, / To crow gently if in luck, / To pay up, to own up, / To shut up if beaten, / Are the virtues of a sporting man. This above all: to thine own self be true, / And it must follow, as the night the day, /Thou canst not then be false to any man. Thus it is well to seem merciful, faithful, humane, sincere, religious, and also to be so; but you must have the mind so disposed that when it is needful to be otherwise you may be able to change to the opposite qualities. It’s actually easier to truly become a person of good character than to persuade others we are what we are not. What a person praises is perhaps a surer standard, even, than what he condemns, of his character, information and abilities. You will become as small as you controlling desire; as great as your dominant aspiration. Show class, have pride, and display character. If you do, winning will take care of itself. What is popular is not always right, and what is right is not always popular. I realized that if what we call human nature can be changed, then absolutely anything is possible. From that moment my life changed. There is not good or bad but as thinking makes them to be. Choose your friends by their character and your socks by their color. Be grateful for the joy of life. Be glad for the privilege of work. Be thankful for the opportunity to give and serve. Good work is the great character-builder, the sweetener of life, the maker of destiny. Let the spirit of your work be right, and whether your task be great or small you will then have the satisfaction of knowing it is worthwhile. Virtue is like rich stone, best plain set. Emotional maturity is ability to stick to a job and to struggle through until it is finished; to endure unpleasantness, discomfort, and frustration; to give more than is asked for or required; to size things up and make independent decisions; to work under authority and to cooperate with others; to defer to time, other persons, and to circumstances. There are two lives to each of us, the life of our actions, and the life of our minds and hearts. History reveals men’s deeds and their outward characters, but not themselves. There is a secret self that has its own life, unpenetrated and unguessed. We are spinning our own fates, good or evil, and never to be undone. Every smallest stroke of virtue or of vice leaves its ever so little scar…Nothing we ever do is, in strict scientific literalness, wiped out. If to do good were easy as to know what were good to do, chapels had been churches, and poor men’s cottages princes’ palaces. The choices that make a significant difference in our lives are the tough ones. They’re not often fun or easy, but they’re the ones we have to make, and each is a deliberate step toward better understanding who we really are. Civilization is first of all a moral thing. Without truth, respect for duty, love of neighbor, and virtue, everything is destroyed. The morality of a society is alone the basis of civilization. The person of intellect is lost unless they unite with energy of character. When we have the lantern of Diogenes we must also have his staff. is easy enough to arouse in a listener a desire for what is honorable; for in every one of us nature has laid the foundations or sown the seeds of the virtues. We are born to them all, all of us, and when a person comes along with the necessary stimulus, then those qualities of the personality are awakened, so to speak, from their slumber. How can they expect a harvest of thought who have not had the seed time of character? The crown and glory of life is character. It is the noblest possession of a man, constituting a rank in itself, and an estate in the general good- will; dignifying every station, and exalting every position in society. It exercises a greater power than wealth, and secures all the honor without the jealousies of fame. It carries with it an influence which always tell; for it is the result of proved honor, rectitude, and consistency- qualities which, perhaps more than any other, command the general confidence and respect of mankind. One of the troubles of our times is that we are all, I think, precocious as personalities and backward as characters. Everybody can be great. Because anybody can serve. You don’t have to have a college degree to serve. You don’t have to make your subject and your verb agree to serve… You don’t have to know the second theory of thermodynamics in physics to serve. You only need a heart full of grace. A soul generated by love. Whatever is true, whatever is noble, whatever is right, whatever is pure, whatever is lovely, whatever is admirable, if anything is excellent or praiseworthy, fix your thoughts on such things. Reputation, reputation, reputation! O, I ha’ lost my reputation, I ha’ lost the immortal part of myself, and what remains is bestial! People who pay too much attention to their reputation – what people think of them – often lose their character. The two most precious things this side the grave are our reputation and our life. But it is to be lamented that the most contemptible whisper may deprive us of the one, and the weakest weapon of the other. A wise man, therefore, will be more anxious to deserve a fair name than to possess it, and this will teach him so to live as not to be afraid to die. Whatever you lend let it be your money, and not your name. Money you may get again, and, if not, you may contrive to do without it; name once lost you cannot get again. Reputation is a reward, to be sure, but it is really the beginning, not the end of endeavor. It should not be the signal for a let-down, but rather, a reminder that the standards which won recognition can never again be lowered. From him who gives much – much is forever after expected. Of course, our assessment of a person’s character is an opinion and it isn’t always right. Abraham Lincoln recognized an important difference between character and reputation. “Character,” he said “is like a tree and reputation like its shadow. The shadow is what we think of it; the tree is the real thing. Because the shape of a shadow is determined by the angle of light and the perspective of the observer, it’s not a perfect image of the tree. In the same way, reputation is not always an accurate reflection of character. Some people derive more benefit from their reputation than they deserve; others are better than their reputations. Still, reputation matters. It determines how others think of us and treat us and whether we are held in high or low esteem. That’s why many people and organizations are so preoccupied with their image that they actually undermine their character by concealing or creating facts to make them look better. It’s ironic that reputations are often the result of dishonesty or the lack of accountability. The only time you realize you have a reputation is when you’re not living up to it. Nothing deflates so fast as a punctured reputation. To enjoy a good reputation, give publicly, and steal privately. Many men and women enjoy popular esteem, not because they are known, but because they are not known. Confessions may be good for the soul but they are bad for the reputation. With lies you may get ahead in the world – but you can never go back. ¾ Margaret Mitchell, Gone With the Wind (1936). Good name in man and woman, dear my Lord,/ Is the immediate jewel of their souls;/ Who steals my purse steals trash; ‘tis something, nothing;/ ‘Twas mine, ‘tis his, and has been slave to thousands; But he that filches from me my good name/ Robs me of that which not enriches him,/ And makes me poor indeed. Property may be destroyed and money may lose its purchasing power; but, character, health, knowledge and good judgment will always be in demand under all conditions. Success is always temporary. When all is said and one, the only thing you’ll have left is your character. By constant self-discipline and self-control, you can develop greatness of character. The Prophet (peace be upon him) said, ‘If you guarantee me six things on your part I shall guarantee you Paradise. Speak the truth when you talk, keep a promise when you make it, when you are trusted with something fulfill your trust, avoid sexual immorality, lower your eyes, and restrain your hands from injustice. When we say someone has good character we are expressing the opinion that his or her nature is defined by worthy traits like integrity, courage, and compassion. No one is born with good character; it’s not a hereditary trait. And it isn’t determined by a single noble act. Character is established by conscientious adherence to moral values, not by lofty rhetoric or good intentions. THE ASPEN DECLARATION 1) The next generation will be the stewards of our communities, nation and planet in extraordinarily critical times. 2) In such times, the well-being of our society requires an involved, caring citizenry with good moral character. 3) People do not automatically develop good moral character; therefore, conscientious efforts must be made to help young people develop the values and abilities necessary for moral decision making and conduct. 4) Effective character education is based on core ethical values rooted in democratic society, in particular, respect, responsibility, trustworthiness, justice and fairness, caring, and civic virtue and citizenship. 5) These core ethical values transcend cultural, religious and socioeconomic differences. 6) Character education is, first and foremost, an obligation of families and faith communities, but schools and youth-service organizations also have a responsibility to help develop the character of young people. 7) These responsibilities are best achieved when these groups work in concert. 8) The character and conduct of our youth reflect the character and conduct of society; therefore, every adult has the responsibility to teach and model the core ethical values and every social institution has the responsibility to promote the development of good character. Character development is the great, if not the sole, aim of education. Good character is more to be praised than outstanding talent. Most talents are, to some extent, a gift. Good character, by contrast, is not given to us. We have to build it piece by piece-by thought, choice, courage and determination. Nothing is more important for our personal happiness and for the good of society than acquiring the dispositions and habits which constitute good character. It’s easier to make a good person better than to make a bad person good. Throughout our history, wise thinkers and average men-on-the-street have recognized that it is character that counts. Heraclitus wrote, Character is destiny. The success or failure of character formation determines the destiny of each of us. It determines, too, the destiny of our nation. If each of us is to be fully human, then, we need to form strong characters. Babies are born with neither good nor bad character. Normal people – as they grow, learn and are trained – develop better or worse dispositions and habits of conduct. We are born with a potential for good character- and for the dispositions and habits that make up bad or weak character. Because we are born in ignorance of moral ideals, however, we must be instructed or trained if we are to achieve a good second nature. Character grows in the soil of experience with the fertilization of example, the moisture of ambition, and the sunshine of satisfaction. Character cannot be purchased, bargained for, inherited, rented or imported from afar. It must be home-grown. Purely intellectual development without commensurate internal character development makes as much sense as putting a high-powered sports car in the hands of a teenager who is high on drugs. Yet all too often in the academic world, that’s exactly what we do by not focusing on the character development of young people. The formation of character in young people is educationally a different task from, and a prior task to, the discussion of the great, difficult, ethical controversies of the day. First things first. And planting the ideas of virtue, of good traits in the young, comes first. In the moral life, as in life itself, we take one step at a time. Every field has its complexities and controversies. And so does ethics. And every field has its basics. So too with values. Nothing is more important for the public wealth than to form and train youth in wisdom and virtue. Only a virtuous people are capable of freedom. Nothing is more important for our personal happiness and for the good of society than acquiring the dispositions and habits which constitute good character. If we don’t invest now in building character into children, we will surely invest more tomorrow in trying to repair adults. Purely intellectual development without commensurate internal character development makes as much sense as putting a high- powered sports car in the hands of a teenager who is high on drugs. Yet all too often in the academic world, that’s exactly what we do by not focusing on the character development of young people.